What to expect: You will be empowered to leave the retreat in a very different state of being than when you arrived. You will feel aligned, alive, and activated. You will deeply remember the wisdom you need most immediately and in the future. You will know in your heart that the answers are truly within you and trust yourself. You will be clear about what you want in your life and and will have a plan to turn your desires and dreams into your manifested reality. Sample schedule: All retreats are designed for each specific participant and will include special self- care perks! You will have input in the perks that you will receive from Kat or one of her trusted team. Day 1. Arrive in the afternoon. Check in. Get settled. Free time to explore or relax until 6PM. You may want to get a massage or take a luxurious bubble bath using Kat’s blend of aromatherapy designed specifically for you. 6:00pm: Nutritious and delicious dinner. 7:00-10:00pm: One-on-one work with Kat. These sessions are created for you based on your initial intake, consultation and any pre-retreat work requested. Kat will have an evening of transformation prepared for you. You will dive-in and begin busting through those silly limitations! We will call upon the guidance of the Arch Angel Michael to protect us with his sword and create the best possible outcomes for our journey together. Early morning to 10 am: Nutritious and delicious breakfast. Complete morning assignment and self-care time. 10:00 am – 11:00 am: Meeting with Kat. Hike to a gorgeous and powerful sacred site on the San Mateo Coast. 12:00: Nutritious and delicious lunch. 1:00 – 3:00 pm: Work intensive with Kat. Possibly we will go on a field trip to the local outdoor Labyrinth, a place of introspection and meditation. 3:00-5:00pm: Self-Time: massage, bodywork acupuncture, gather and re-charge. 7:30pm: Session with Kat. Home Play adventure. 10:00am-12:00pm: Wrap up with Kat. By the time you leave, you will be ready with an action plan and the inner knowledge that you will complete it successfully. You will trust yourself enough to know what is in your best interest and you will have no trouble adapting as life evolves along with your personal evolution. The cost of this customized retreat includes an initial strategy call, all accommodations, customized meals and snacks that are nutritious, delicious and take into account any personal preferences or allergies, one perk treatment such as massage, acupuncture, facial, makeover or customized modality that will best support your needs. You will also receive two follow up sessions within 30 days of your retreat to address any tune-ups, adjustments or questions that may arise. Thinking about signing up for a Customized Personal Intensive Retreat? Contact Kat for a complimentary call to explore this option for you! 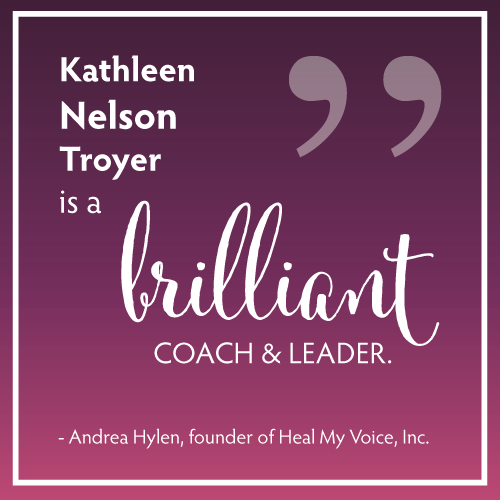 I highly recommend Kathleen for busy professionals who are already successful in their careers but are interested in taking things a step further.